Me and craft beer travel well together. It’s one of my favorite ways to learn about the local culture of a new place if you haven’t realized that from my blog yet. I started finding article after article about how Grand Rapids is the new mecca for craft beer, if not in the whole of North America, at least in the midwest. And some would argue that they have the best craft beer scene in America. 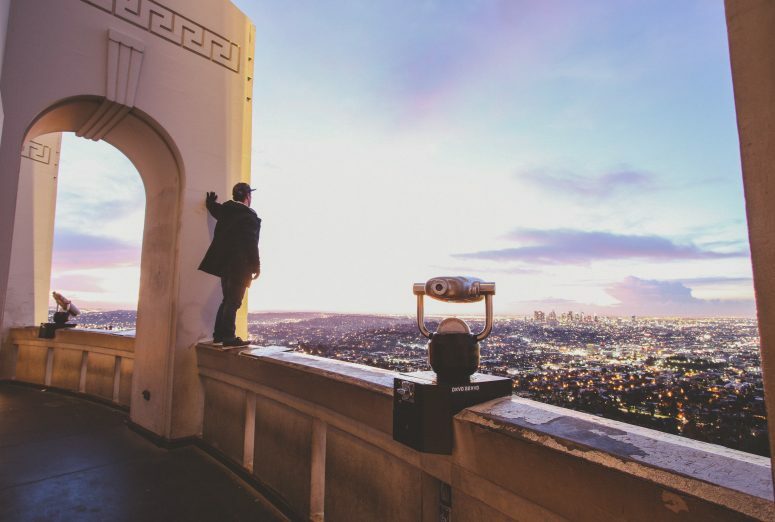 It was up there in the top 3 for me – along with San Diego and Portland. The Beer City Ale Trail (also known as the official Grand Rapids brewery map) provided by Experience Grand Rapids has over 40+ Grand Rapids breweries on it, and the city has been voted Beer City USA in national polls, as well as the Best Beer Town and Best Beer Scene by USA Today readers. Now, I’m not going to go through and talk about every brewery in Grand Rapids, that would take a whole e-book. However, I did want to write about a few of the ones I visited while I was in town when I decided to do my own DIY Grand Rapids beer tour, as well as others that I didn’t have a chance to visit but heard rave reviews about. If you’re a craft beer fiend like me, make sure to visit Grand Rapids while you’re traveling around Michigan and add these Grand Rapids breweries to your own Michigan brewery map. Their beer will surprise you, bring you to another level, and wrap you up in the warm embrace of Midwest friendliness. It’s saying something when I can travel and hang out in bars or breweries by myself and feel right at home. So, are you ready for your next beercation? These were some of my favorite Grand Rapids breweries in town. The first stop on my list of breweries in Grand Rapids, MI was Brewery Vivant, where I went for dinner and a pint. I don’t think I could’ve picked a better spot for my introduction to beer in Grand Rapids. Brewery Vivant ended up being my favorite, as well as Harmony Brewing, while I was in town. They’re the first LEED-certified production brewery in the USA, meaning Leadership in Energy & Environmental Design in their building of the place. They care about sustainability and being green, which is always a plus in the industry. You can bring back old cans of theirs to the brewery to recycle. They use cans to package their Michigan beers in the first place because it’s not only better for the beer, but aluminum is more easily recycled than glass bottles. One of the reasons why I loved this Grand Rapids brewery so much was the attention to detail in their beers. They brew very unique, mostly Belgian style, beers that left my taste buds curious and wanting more. The brewery was inspired by the small farm breweries you tend to find in southern Belgium and northern France, and the creative brewing that is found in those places. If you have a pint, or tulip, here, be prepared to try some uncommon, delicious, and hearty beers. I tried one of their wood-aged bourbon beers, called the Sticky Stave, and it was all kinds of scrumptious. And, they’re well known for their food as well, again very European and very hearty. 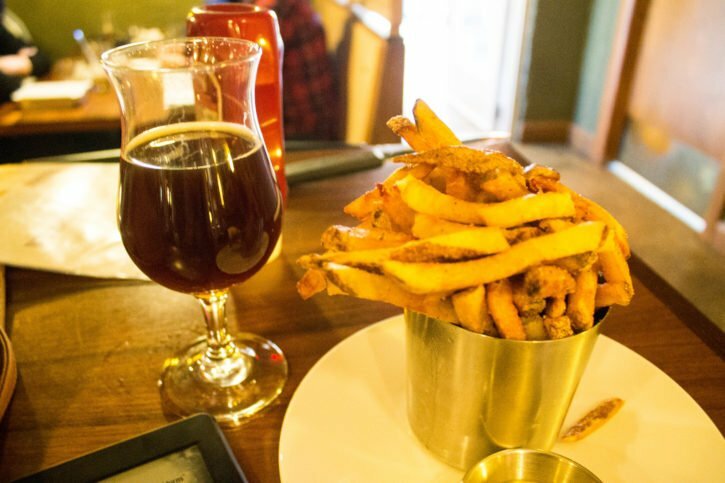 Go for their garlic truffle fries and you will not be disappointed! This place by far was one of the best breweries in Grand Rapids. They had the most delicious beer and food that I tried my whole trip. Lastly, the atmosphere of the brewery was unbeatable. It was set-up in communal tables and had the feel of a modern-day Belgian monastery. The area around the brewery is one to note as well. It’s just outside of downtown, and it’s a great little place to walk around, window shop, and hangout. It’s also near the historic houses on Cherry Street, one of my favorite streets in Grand Rapids to stroll down and take in the historic architecture. Practical info: 925 Cherry Street. Monday to Thursday: 3pm-11pm; Friday: 3pm-12am; Saturday: 11am-12am; Sunday: 12pm-10pm. Elk Brewing was my second stop on my DIY Grand Rapids brewery tour. By the time I arrived at the brewery, I was fading fast. Even though it was only 8 pm, I hadn’t slept in over 35 hours at this point. 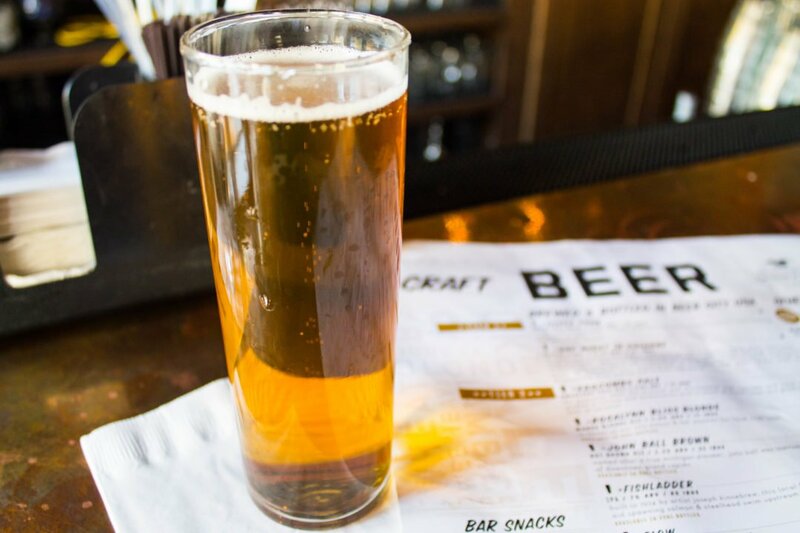 After taking a red-eye flight from Portland, a bus from Chicago to Grand Rapids, and checking into my hotel, I had immediately taken off to explore the beer culture around town. I take my craft beer adventures seriously, and I wasn’t going to let my first night go by without visiting at least a couple of Grand Rapids, Michigan breweries. I sat down at a table and nursed my beer for a good 20 minutes or so, taking in all of the lovely roasted flavors of coffee in the smooth porter. It finished with a slight undertone of chocolate and I was over the moon. It was the perfect beer to finish on after a long day of travel. Elk Brewing has a laid back atmosphere and a standard clean tasting room, with wood finishes and almost a cabin, feel to it. The brewery is fairly new to the Grand Rapids craft beer scene, having only opened in May 2014. It was started by a couple who fell in love with each other, and brewing, while they were in college and decided to open up their own brewery. The name Elk comes from their two names put together – Erick and Lisa Karns. 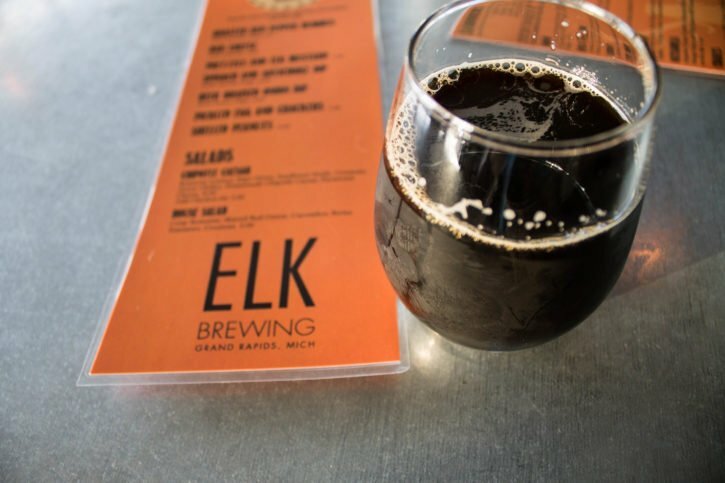 The Elk might be one of the best breweries in Michigan. The brewery is located just around the corner from Brewery Vivant and has a patio out front for nice summer days in Michigan. They use a 3 barrel brewing system, which means that their beer is always changing and fresh. Elk Brewing has a lot of traditional styles that tend to have a bit of quirkiness to them – like the coffee porter I was sipping on (they also have a hazelnut coffee porter, yum!). Their six flagship beers include the Light Ale, ESB, English Style IPA, Porter, Scotch Ale, and Rye IPA. Practical info: 700 Wealthy Street SE. Monday: 3pm-10pm; Tuesday to Thursday: 3pm-11pm; Friday & Saturday: 11am-2:am; Sunday: 12pm-10pm. The biggest of the Grand Rapids breweries that is also seen as the most commercial. You can find bottles of Founders Brewing in Portland, Oregon if you want, as well as quite a few other places. If you’re looking for one of the most popular bras in Grand Rapids that serve craft beer, this is it. The brewery, restaurant, and tasting room itself are quite big. There are multiple areas to sit and it would be great for big groups. I had a massive tasting tray in front of me within 10 minutes of sitting down. There were more beers than I could handle, yet, I wanted to try as much of their huge selection as I could. 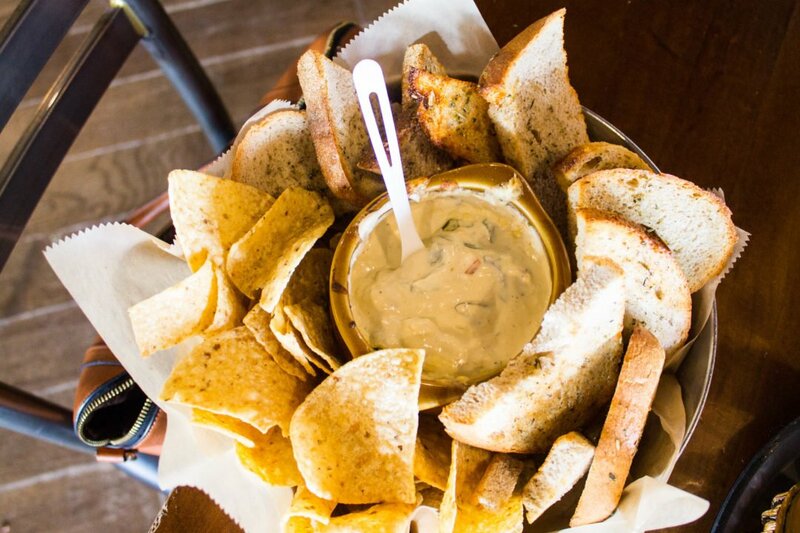 I was also able to try their beer cheese, and OH MY GOD how is that even legal? It was so lip-smacking good. I’m still thinking about it a month later. I found the beers at this top brew to be a little bit of everything. There were the funky flavors and the classic favorites, a beer for everyone, really. They also had a lot of entry-level and fruity type beers that would be a good introduction for anyone who is still unsure about liking beer. The fact that they have a nitro draft series made me fall in love with the brewery almost immediately, and I could see why it was referred to as one of the top breweries in Grand Rapids. Anyone who knows me knows how much I love the smooth creamy flavors of beer on nitro. So tasty! The fruity Rubaeus and the drinkable All Day IPA were some of my favorites. I usually don’t like fruity beers (unless they’re sours), so the Rubaeus was just that tasty. Founders has been ranked in the top breweries in the world by Ratebeer.com many times, which may give you a clue to the quality of their product and their high standing in the Grand Rapids craft beer industry. Practical info: 235 Grandville Avenue SW. Monday to Saturday: 11am-2am; Sunday: 12pm-12am. Grand Rapids Brewing Co. is the place to go if you want a proper bar atmosphere, often packed to the brim with people drinking beer. This brewery also came off to me as more commercial than the other breweries in Grand Rapids that I visited, but I enjoyed the beer they poured and the great service from the staff. I believe that any Grand Rapids brewery tours would not be complete without stopping at this brewery. When I first walked into the bar, it was a Sunday night and it was packed with lines of people waiting for tables. I decided to come back the next afternoon and was delighted to find an almost empty and open bar inside. They had rugby on TV as well for which I’ll give them kudos for. 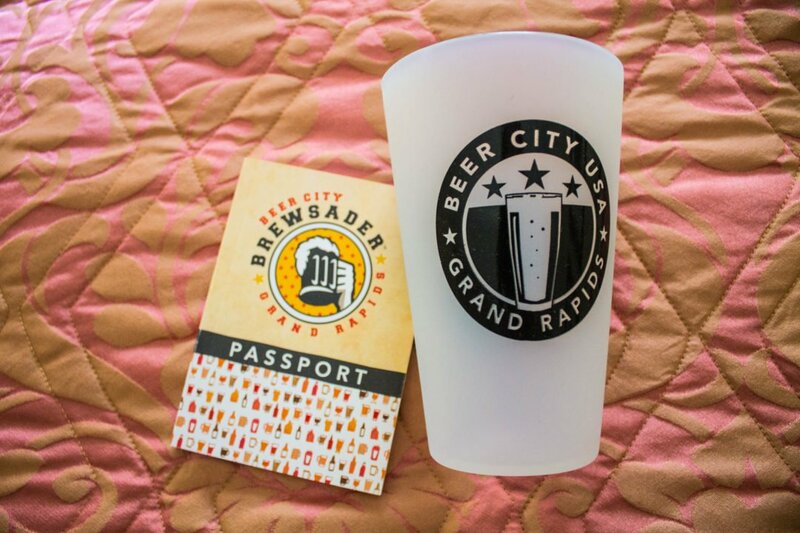 You wouldn’t guess it from walking into the sparkling new brewery, but Grand Rapids Brewing Company is actually the oldest Grand Rapids breweries as well as one of the oldest breweries in Michigan. The brewery started in 1863 but fell off the radar once Prohibition came to the USA in the 1920s. 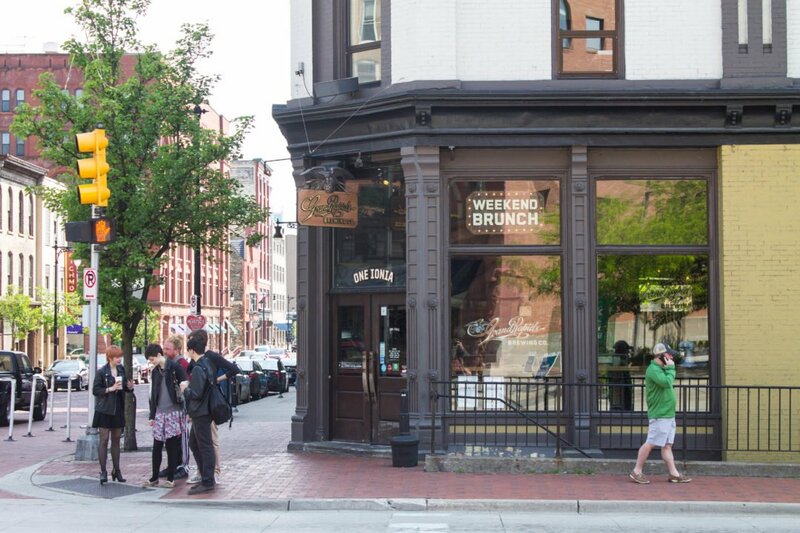 It was brought back by Mark Sellers in 2012 and opened 6 blocks from its original location. It’s also a brewery that cares a lot about sustainability. This is seen with the interior of the bar that uses reclaimed materials for the floors, tables, and walls. And they recycle or compost 90% of their waste as a brewery, how cool is that?! Grand Rapids Brewing Company focuses on small-batch brewing. 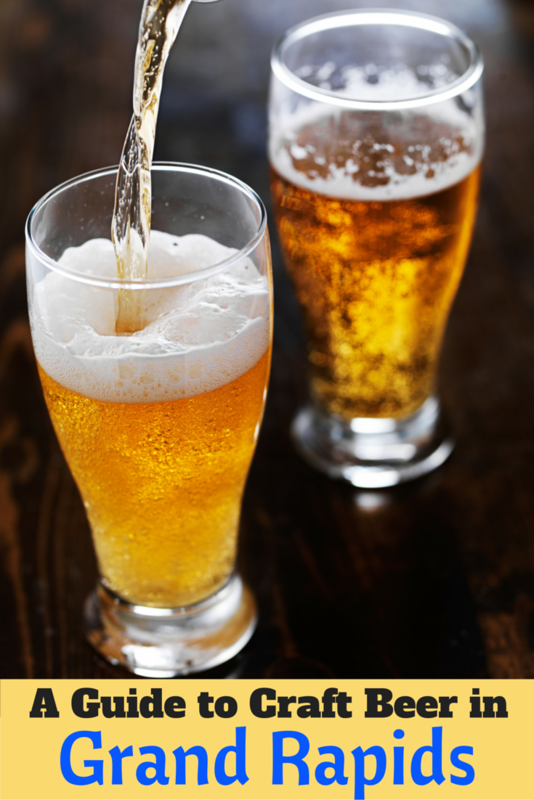 Their most famous beer is the Silver Foam, which is a take on the original lager that was first brewed in 1893. I tried their One Night in Cologne Kolsch and loved the crisp, slightly fruity pear flavors. The yeast strain used in the Kolsch is actually propagated from a brew pub in Koln, Germany as well. Practical info: 1 Ionia Avenue SW Suite 1. Monday to Thursday: 3pm-12am; Friday: 11am-2am; Saturday: 10am-2am; Sunday: 10am-12am. The next stop on my tour of breweries in Grand Rapids, Michigan is Hopcat. Since its opening in Grand Rapids in 2008, HopCat has turned into a popular Michigan chain. It can be found in multiple locations around the Midwest (including Detroit). I was impressed when I walked down the street and stumbled into a welcoming sports bar with 49 taps. 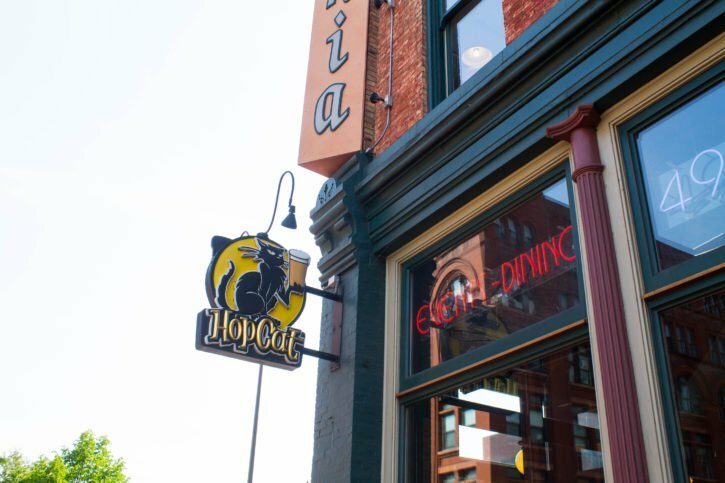 HopCat brews their own beer but also has a great variety of other beers, both local and international, on tap. These fill up their bar with every imaginable style of beer. Being right in the middle of downtown, I could see this place being a popular weekend hangout, as well as a necessary stop for a DIY Grand Rapids beer tour. 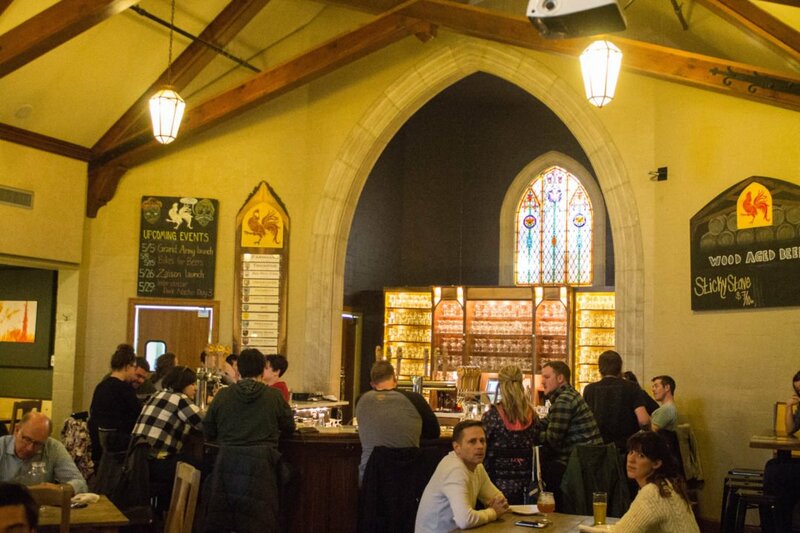 Beer Advocate has ranked these guys in Grand Rapids as the 3rd best beer bar in the world. I would agree that the atmosphere was great, from walking into taking the last sip of my beer. It was overwhelming with the choices I had in front of me, but I went with one of the HopCat beers. It was the American Wild Ale, Unicorn On Acid. Okay, I partially chose it because of the awesome name. I also love sours and this was one of the best sours I’ve tried in a very long time. Perfectly puckery and delicious, a perfect Grand Rapids beer to keep the day flowing. Practical info: 25 Ionia Avenue. Monday to Sunday 11am-2am. My second favorite brewery in Grand Rapids ended up being Harmony Brewing Company. They mostly stole my heart due to the ridiculously kind and friendly staff… as well as their savory pizza! The brewery is located a short distance outside of town, but well worth the walk or drive. Also, their branding was perhaps my favorite out of all the breweries, but that’s just a side note. They actually have two locations; I went to the Eastown location, which is their brew pub, not their brewery. Now, let’s talk about the pizza. 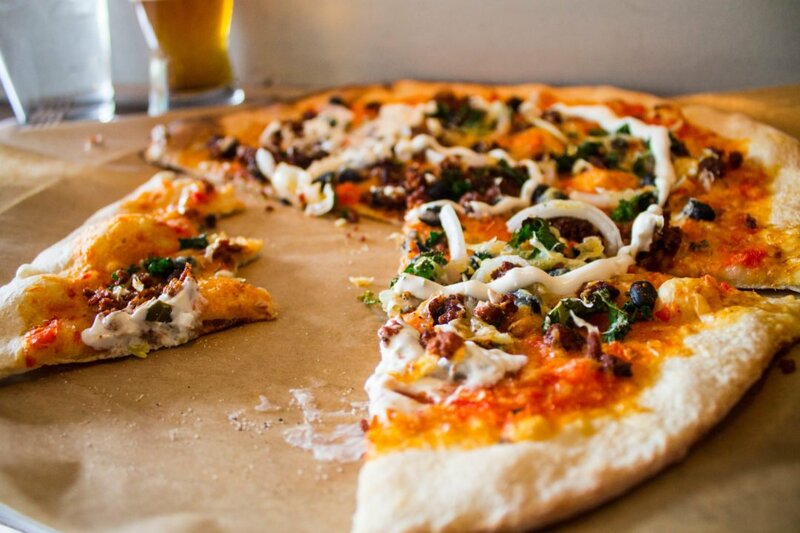 It’s wood-fired and the dough is made from scratch every day and topped with super creative fresh ingredients. I tried one of their specials which had Mexican spiced flavors to it and it was heavenly with beer. Similar to their unique pizza options, their beer is just as unique. Harmony has everything from grapefruit IPAs, to red ales with a ginger bite, black cream ales, and elderberry pale ales. It’s a creative brewer’s (and beer drinker’s) dream come true. I tasted their Crossroads American Rye IPA after my server recommended it. It was tasty and deliciously hoppy without blowing my face off. Practical info: 1551 Lake Drive SE. Monday to Saturday: 11am-12:00am; Sunday 12:00pm-12:00am. Lastly, I was recommended the following Grand Rapids breweries multiple times, but due to time constraints was unable to visit them. I think they still deserve a mention though! I was warned that B.O.B.’s Brewery had strange hours. That was made clear when I tried to go there twice but found it closed both times. Regardless, I’ve heard it’s a place to stop in at while you’re in town, and could possibly be the best brewery in Grand Rapids. This is the oldest craft brewery in downtown Grand Rapids – or should I say, continuous brewery, since Grand Rapids Brewing Co. is really the oldest – and is known for their food, small batch beers, and their variety of events & gigs. Within the “Bob” building they have 4 restaurants, a craft brewery, a live music venue, nightclub, and a stand-up comedy club. Yes, it’s huge. Practical info: 20 Monroe Avenue NW. Wednesday: 5pm-10pm; Thursday: 4-10pm; Friday & Saturday: 5pm-12am; Sunday to Tuesday: Closed. The Mitten Brewing Co. was one of the Michigan microbreweries I really wanted to visit while I was in town, but due to it being a bit further out of the city, I didn’t end up making it there. I’ve heard their pizzas are some of the best in Grand Rapids, and they call themselves a vintage baseball-themed microbrewery/pizzeria. Um, cool alert! The brewery is located in a historic Victorian building, and they partner with different non-profit organizations every month. They truly know the meaning of giving back, having raised over $100,000 for local causes since they opened in 2012. I’ll definitely be making a visit into The Mitten next time I’m in town. Practical info: 527 Leonard Street NW. Sunday to Monday: 11:30am-10pm; Tuesday to Saturday: 11:30am-12am. Have you tried any of these breweries before? 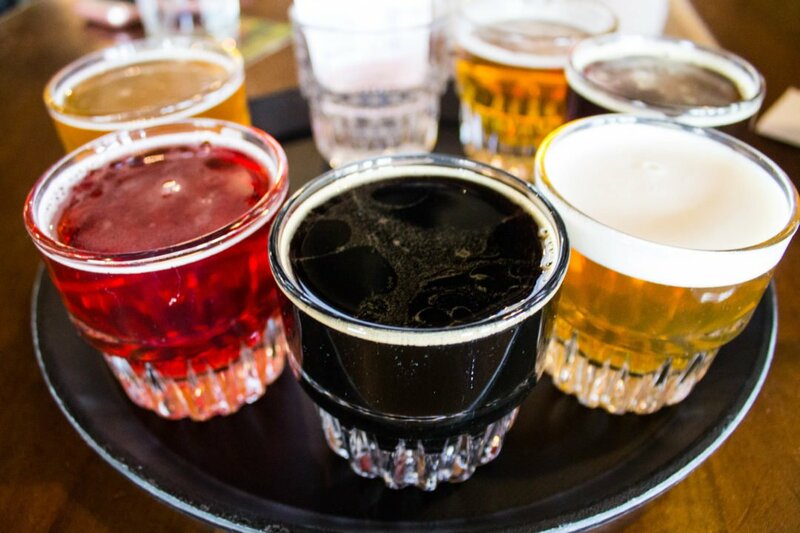 Which Grand Rapids brewery is your favorite from this list? This stunning, luxurious hotel is one of the top-rated hotels in Grand Rapids. Guests can enjoy the indoor pool as well as their large, elegant rooms. There is an on-site Starbucks and restaurant that serves a buffet breakfast and French cuisine for lunch and dinner. Room service is available, and guests can enjoy spa treatments at the hotel’s spa. The JW Marriott is located in the heart of the city and is close to restaurants, shops, and entertainment. The Lafayette House Bed & Breakfast offers guests a cozy getaway during their stay in Grand Rapids. This mid-range hotel is located near popular attractions such as Devos Hall, Grand Rapids Art Museum and DeVos Plac. The Lafayette House offers guests free Wifi, TV, air-conditioning and a full American style breakfast. For anyone who is looking for budget-friendly accommodations, Motel 6 is worth checking out. This motel is located near Fifth Third Ballpark and 12 miles from the airport. The Motel 6 offers guests an indoor swimming pool, fitness center, cable TV and free Wifi. Find accommodation and book your rental car. Buy your Michigan Travel Guide here. 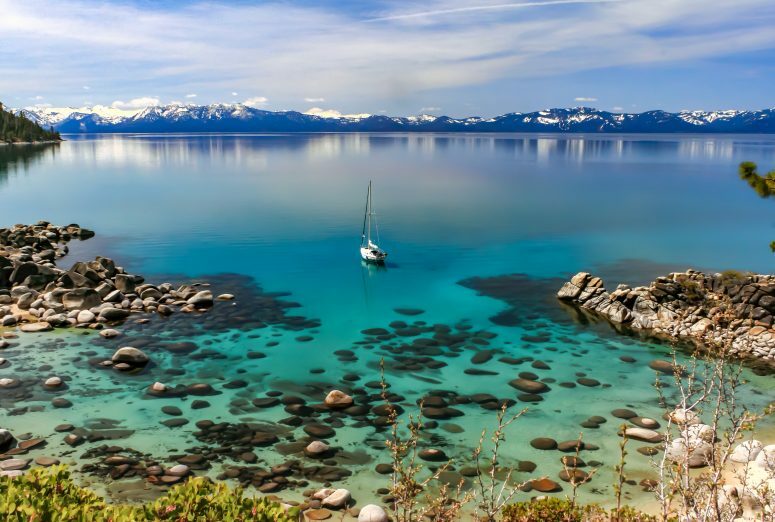 NEED HELP PLANNING YOUR TRIP TO MICHIGAN? 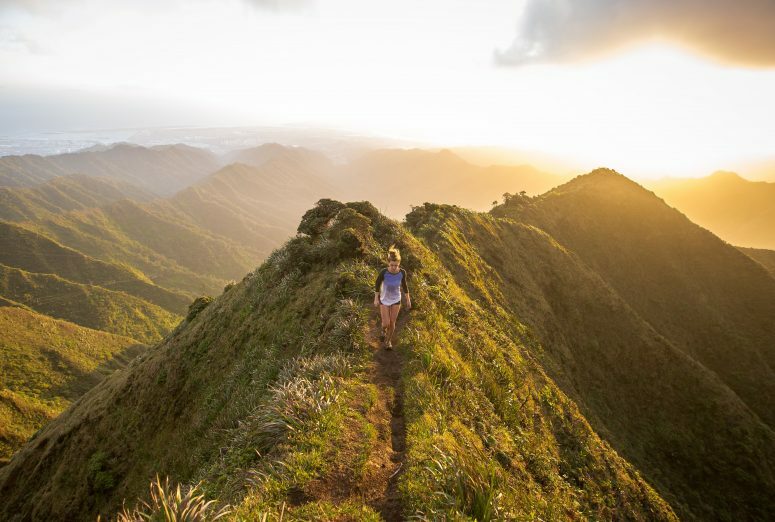 FIND INSPIRATION FROM THESE BLOG POSTS! Founders… my husband loves it! If you’re still in the mitten (what us Michiganders like to call it) visit Kalamazoo, Michigan. Amazing atmosphere, food and BEER! Cheers! Ahhhh that’s why The Mitten Brewery is called as such, I was wondering about that. I’ll have to check out Kalamazoo next time I’m in the state, I’ve heard great things about the beer there too. Thanks Lesley! Yep! 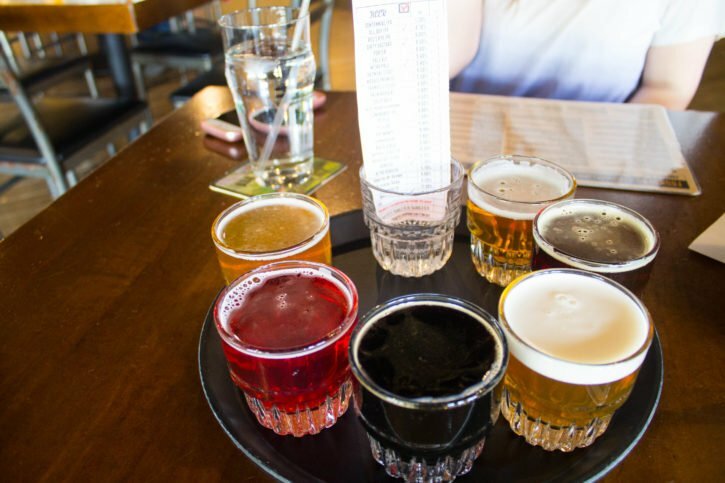 There’s a huge craft beer scene in Grand Rapids – you’ll have to check it out at some point Amy! Yay! I’m bookmarking this – definitely going to come in handy when I visit in November! This is my favorite type of “city guide”! I love going to breweries. Have you ever heard of Orpheus? It’s an Atlanta based beer… I went to their brewery for my birthday and spent 5 hours drinking high gravity saisons! It was pure bliss. I will definitely be saving this for is I ever make my way to Grand Rapids. Me too! I love exploring the local beer culture in new cities. I haven’t heard of Orpheus, I’ll have to look out for it, and definitely try it when I’m in Atlanta next. 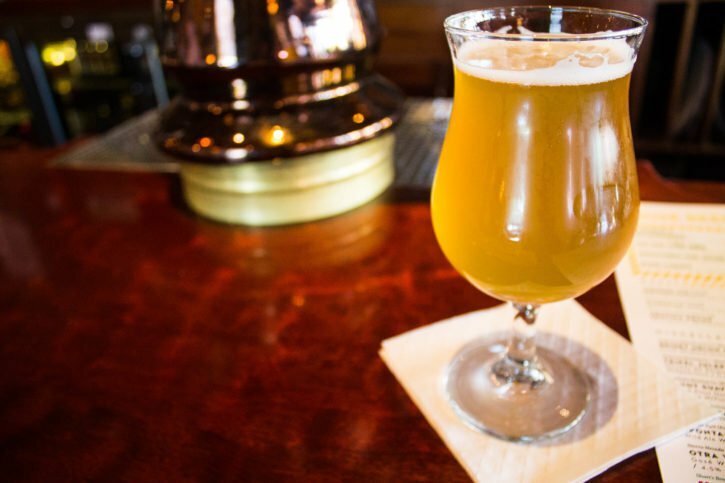 Um, high gravity saisons sound sooo good! Thanks for the recommendation Alexandria! 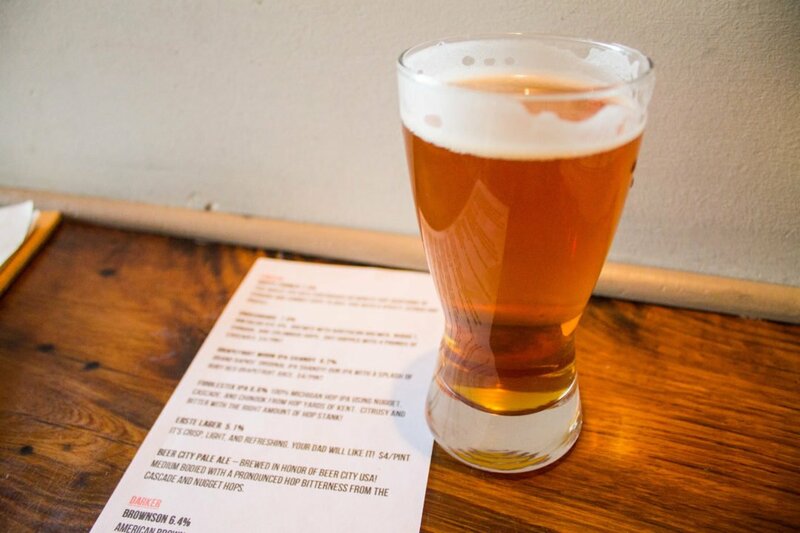 What a great craft beer guide! I love learning about craft beverages in the cities I travel to and will have to pin this one if I ever go there in the future! Looks like a fun town with some delicious beer! Thanks Marlynn! Grand Rapids is definitely a fun city with an awesome scene for craft beer. Great article! I live right around the corner from Brewery Vivant, so I’m fairly well-acquainted with the GR craft beer scene! GRBC and Vivant are some of my favorite spots, but that’s primarily because I’m not much of an IPA drinker, and places like Founders and Perrin are famous for their (admittedly quite delicious and drinkable) pale ales. One brewery that wasn’t listed on the ale trail map, for some reason, is Short’s Brewery up in Bellaire, MI. It’s a bit of a hike north from GR, but sooooo worth the trip if you’re every visiting the west coast of Michigan in the future. They have some of the most unique and delicious seasonal beers, as well as some amazing year-round standards. You mentioned you’re not a big fan of fruity beers, but if you’ve never tried Short’s soft parade, I would HIGHLY recommend it. I always say that it’s “a beer for everyone, no matter what kind of beer you usually like!” Other great beers from short’s are the Bellaire Brown and the Nicie Spicie. Some other people have already recommended visiting Kzoo as well, and I definitely second this! Bell’s brewery has an awesome beer garden and soooo many great beers to choose from. And, if you’re here in the summer, it’s Oberon season! 🙂 Glad you enjoyed your trip to the Craft Beer Mecca of the Midwest. Come back soon!